With so much choice in such diverse destinations deciding where to stay can be difficult, particularly for first time travellers to the area. If you are restricted on when you can travel then we recommend checking out our Climate and Golf Seasons page first before looking at the destinations. The first thing to say is that our East coast destinations are all close together so make a great location for a golf trail. Myrtle Beach, Pawleys Island, Charleston, Kiawah and Hilton Head all fall within a stretch of South Carolina coastline that you could drive in around four hours. Sawgrass is just over three hours south of Hilton Head in North Florida with the World Golf Village in St. Augustine just a few minutes south of that so an East coast multiple destination golf holiday can be a very enticing proposition with plenty of great golf and not too much driving. In Arizona we can combine Scottsdale and Sedona as destinations, while we also have contacts that can put together extensions for Las Vegas, Nevada and Palm Springs, California. We can tailor any multi stop trip to suit you or, why not try out our Dyeabolical Golf Trail taking in such Pete Dye classics as Ocean Course Kiawah, Harbour Town Golf Links on Hilton Head and TPC Sawgrass. Deciding which of our East coast destinations would suit you for a one stop stay is part taste, part budget. The cheapest accommodation and golf can be found in the Myrtle Beach area, it is also the most commercial area with plenty to see and do, a vast number of restaurants and bars, shopping and attractions to choose from and over 80 championship golf courses within an hours drive of the centre. Pawleys Island is just 30 minutes south of Myrtle Beach but a world away in character. Much quieter but with plenty of fine dining, quaint shopping malls and some of the very best golf courses in South Carolina and rates are very reasonable. Flights: For Myrtle Beach and Pawleys Island you can fly into Myrtle Beach International Airport on a 1 stop route from many UK airports. Historic Charleston is one of the most visited cities in the US but it is also an excellent golf destination with a choice of downtown hotels or island resorts it has a lot to offer. Because of it’s status, Charleston accommodation is expensive when compared to our other South Carolina destinations. A short stay in Downtown Charleston before moving onto one of our other golf destinations is a common choice. Kiawah Island Resort is situated just south of Charleston and is a premier golf resort with reasonably priced villas or the mega expensive 5 Diamond Sanctuary hotel as accommodation options. Golf is expensive, especially if you want to play the world famous Ocean Course. Staying at Kiawah can be expensive so many will book shorter stays, perhaps combined with a few nights at one of our other South Carolina destinations. Kiawah Island is a self-contained golf and beach resort but for extra attractions it is only about a 30 minute drive into Downtown Charleston. Flights: For Charleston and Kiawah you can fly into Charleston International Airport on a 1 stop route from many UK airports. Hilton Head is a quite unique holiday island with plenty to see and do including some great golf but it shies away from commercialism with no billboards or signs above tree height apart from a handful of ocean front hotels. As such it feels very natural and unspoilt. Rates are more expensive than Myrtle Beach and Pawleys Island, but generally cheaper than Charleston and Kiawah. Flights: For Hilton Head you can fly into Hilton Head Island Airport or Savannah International Airport on a 1 stop route from many UK airports. Pinehurst is one of the top ranked golf resorts in the country including the Donald Ross designed Pinehurst No. 2. It is expensive to stay and play there so many people will book 2 or 3 night stays before moving onto a longer stay at one of our South Carolina destinations which are around a 4 hour drive away. Flights: There are direct flights into Charlotte or Raleigh / Durham International Airports from London. There are also 1 stop routes from many other UK airports. 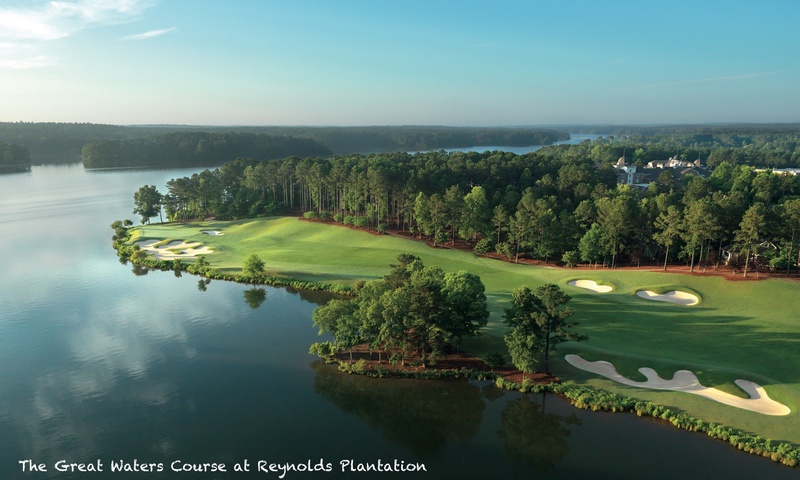 The Ritz-Carlton Reynolds on Lake Oconee in Georgia boasts five top class golf courses so is a great stay and play destination. It is just 90 minutes from Atlanta Airport so easily accessible by direct flight from the UK. Also, it is within 4 to 5 hours drive of all of our East Coast destinations so would make a great add on for guests flying into Atlanta and looking for a 2 centre holiday. Flights: Lake Oconee is around a 90 minute drive from Atlanta International Airport so you can get a direct flight from London or Manchester. Scottsdale in Arizona is a quite different proposition from our East Coast destinations. Apart from being the other side of the United States, it has a desert climate so a much dryer heat, but it does get much hotter. Scottsdale itself feels like it has literally just been built from the ground up yesterday. Everything looks and feels new, symbols of south west Native American art are everywhere, it is a quite unique experience. We love the desert style golf courses. As a change from the low country feel of our East coast destinations it offers a completely different golf experience. Rates in season can be expensive but if you don’t mind the searing summer heat you can get some bargains then. Scottsdale is also a great location if you want to explore some of America’s greatest attractions including Sedona and The Grand Canyon. We can offer accommodation extensions for both locations as an add on if required. Flights: Fly direct from Heathrow into Phoenix, plus 1 stop routes from many UK airports. The appeal of Florida stems from the ease of direct flights from the UK. You can fly into Miami and stay at the Doral Golf Resort or PGA National in Palm Beach. Alternatively, our other featured Florida resorts at Sawgrass, St. Augustine and Tampa are all within a 2 hour drive of Orlando. Sawgrass is famous for one thing, the TPC Stadium Course, home of the Players Championship on the PGA Tour. The onsite Marriott hotel offers upscale accommodation while golf is quite expensive as you would expect, about the same as Kiawah. St. Augustine is home to the World Golf Village which includes the World Golf Hall of Fame. Stay in a World Golf Villa or at the Renaissance Resort Hotel. Doral resort near Miami has four 18 hole golf courses including the well known ‘Blue Monster’ which has hosted many PGA Tour events including World Golf Championship tournaments. Just up the coast from Miami is Palm Beach where you can stay at the PGA National Golf Resort, a regular stop on the PGA Tour. Innisbrook Resort near Tampa also boasts 4 Championship golf courses including the Copperhead Course which is a regular venue on the PGA Tour. Each of our featured resorts are ideal for a single destination package or we can combine two or more resorts in a multi-stop trip. There are many other golf resorts in Florida which we have access to so please do not hesitate to ask us for a quote. Flights: Direct flights to Miami and Orlando. One stop into Jacksonville for Sawgrass and St. Augustine or Tampa for Innisbrook Resort.